We are coming to the end of the planning process. Below are four slideshows that related to choices for public art during the next ten years. View the shows online or download the PDF Versions. The slide shows are not 100% self-explanatory. Check them out. THIS BLOG IS NOT A BLOG OF THE CITY OF POMPANO BEACH. Any information on this blog is SOLELY the responsibility of IBI Group and Glenn Weiss. 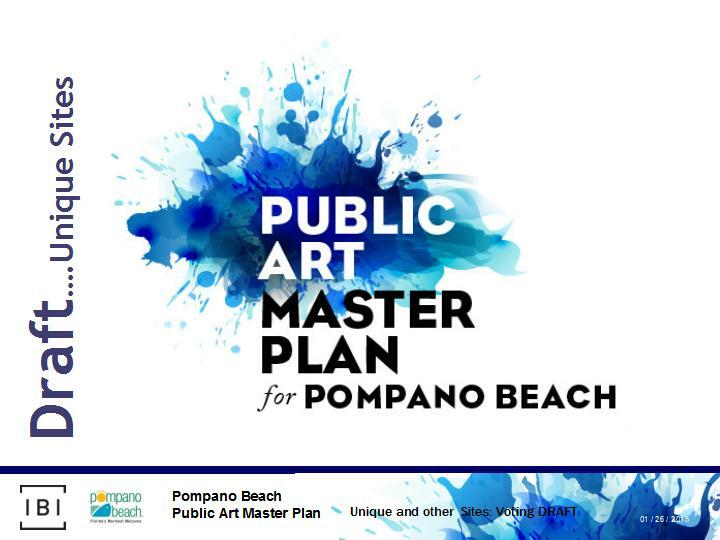 We hope to facilitate public communication and dialogue with the residents, employees and business owners during the development of a Public Art Master Plan for Pompano Beach between Jan-July, 2014. The Master Plan will describe the types of artworks and locations in the City during the next ten years. Any Questions or Comments? Please send us your thoughts and pictures about the future of public Art in Pompano Beach. THIS BLOG IS NOT A BLOG OF THE CITY OF POMPANO BEACH. Any information on this blog is SOLELY the responsibility of IBI Group and Glenn Weiss. Please send complaints or compliments to gw@glennweiss.com.